High-quality clear flexible vinyl sleeve, pocket or envelope. Use as a document holder, sign holder or sheet protector. Made from durable 8-gauge (0.0078" or 8-mil) clear material on the front and back. 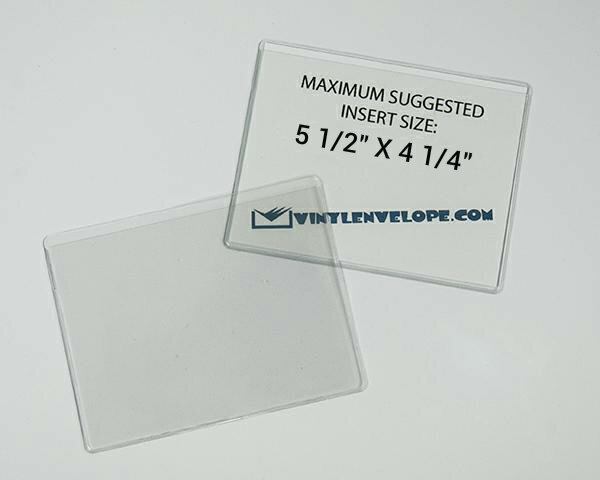 Vinylenvelope.com is able to offer our customers incredible value because we are the manufacturer of this product. Overall dimensions: 5 7/8" x 4 5/8"
Pocket dimensions: 5 7/8 x 4 1/2"
Store, display or protect your documents, signs, instruction manuals, notices, maintenance logs or anything else you can think of. There are endless uses for clear vinyl pouches. Other materials and sizes available. Contact us for prices on larger quantities, different material, thumb notch or other features, custom printing, and more.